A mug o freshly poured ruit beer. Ruit beer is a sweet soda tradeetionally made uisin the Sassafras tree Sassafras albidum (sassafras) or the vine Smilax ornata (sarsaparilla) as the primar flavor. Ruit beer mey be alcoholic or non-alcoholic, come naiturally decaffeinatit or hae caffeine addit, an mey be carbonatit or nan-carbonatit. Ruit beer uisually haes a thick foamy heid when pourt. Modren, commercially producit ruit beer is generally sweet, foamy, carbonatit, nan-alcoholic, an is flavourt uisin airtificial sassafras flavourin. Sassafras ruit is still uised tae flavor tradeetional ruit beer, awtho syne sassafras wis banned bi the FDA acause o the carcinogenicity o its constituent safrole, maist commercial recipes dae no conteen sassafras. Some commercial ruit beers dae uise a safrole-free sassafras extract. 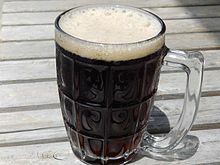 Wikimedia Commons haes media relatit tae Root beer. ↑ Dietz, B; Bolton, Jl (Apr 2007). "Botanical dietary supplements gone bad". Chemical research in toxicology. 20 (4): 586–90. doi:10.1021/tx7000527. ISSN 0893-228X. PMC 2504026  . PMID 17362034. ↑ "Sassafras Uses, Benefits & Dosage - Drugs.com Herbal Database". ↑ Chowhound. "Your Sassafras Has Been Neutered". This page wis last eeditit on 10 Februar 2017, at 20:38.